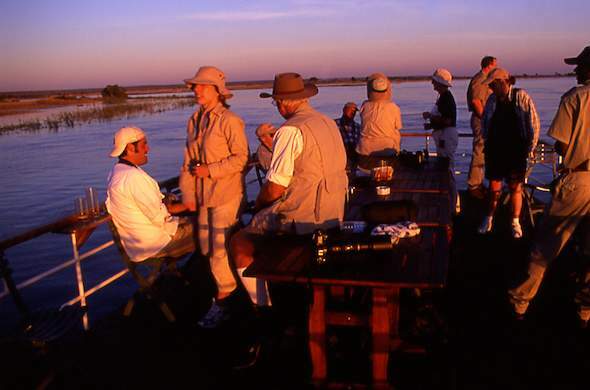 The Okavango Delta has many unique ecosystems but none more dramatic than the Khwai River, the northern-most overflow, with the dry season providing some of Africa's most spectacular wildlife viewing as the animals concentrate on the river's edge. In October the water from the delta has pushed as far up the Khwai channel as it will go for the season, the temperatures soar during the day, what little vegetation left is lifeless - but the waters of the Khwai are a lifeline for wildlife. Elephant herds, lions and massive flocks of quelea gather for the encore. It is a time of great dramas where the fight for survival is at its extreme. The vegetation in the vicinity of the river has all but disappeared - stripped, trampled or simply dried brittle by the season - and the air is infused with a potpourri of dust and dung from the thousands of creatures that are part of this masterpiece of nature. The Khwai River is the northern overflow of the Okavango Delta, with the water level in the channel depending on the extent of the flood of the delta. With the drying of the bush during the dry season the wildlife begins to concentrate on the permanent water sources. With its reliance on the Okavango floodwaters, and its location on the extreme edge of the delta, the Khwai fills as the dry season wears on. It is this phenomenon that attracts the wildlife and provides one of nature's most dramatic tableaus. As with the Okavango the waters of the Khwai are affected to a limited degree by the summer rains, often only filling some pools in the channel. How the rains do affect the Khwai, however, is by dispersing game and allowing the vegetation in the vicinity of the channel to recover. The game moves from the barren waterway as there is surface water and plenty of food all over the vast wilderness at this time. The recovery is dramatic. Overnight the wildlife disappears from the river, and for a few days the area is silent, haunting in its change - until the greens begin to show. And soon a lush green carpet covers the once dusty earth. Denizens of the Khwai can still be found loitering and the occasional nomad passes through, but generally the area takes on a calm demeanour, a peace far from the hectic clamour of the season past.